Happy Wednesday y'all! It's actually going to be a really busy morning for me so I'm just going to jump into today's link-up. I HAVE to say though that y'all need this sweater. It comes in several colors and I am obsessed! Such a good basic for fall and super cozy. Clearly I am Zara OBSESSED at the moment! Also, let me know if you would be interested in a review on this YSL Blogger Bag. I'm basically obsessed but I was thinking about doing a video reviewing it! 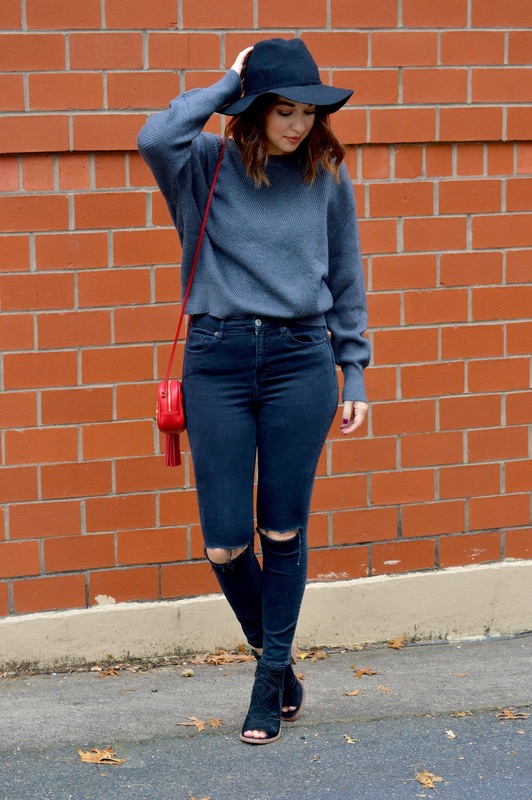 Oh how I love the black distressed jeans, specially with the hat! You look adorable. Drooling over that red bag! It's the perfect pop of color for this look. Love the grey and black with th pop of red! Those jeans look amazing on you! That sweater looks so cozy! I love the pop of color. Such a lovely jumper Kelly! Love your bag too such a gorgeous colour. I would love to see a review. I love the pop of red!! This is such a favorite way to add in a touch of color!! Zara is the absolute best, and I definitely need this sweater! This is my kind of look and I love the pop of red. Gorgeous YSL bag! LOVE this look, girl! I haven't checked out Zara lately, but I obviously need to! Zara has some fabulous stuff right now! Love this sweater and the one you worn on Monday. Both are so cozy! Happy Wednesday, Kelly! The red bag is so cute! Love the bag! Perfect pop of color, you should totally review it! Love your style, this is a great causal look but still looks very put together. I need a cute pair of black booties like this. For some reason, I always go towards taupe. You look awesome!! I need that bag in my life! Too cute! I looove this sweater! And the boots and the red bag! Such a cozy outfit, Kelly!